Finland's controversial entry for this year's Eurovision Song Contest - a heavy metal band called Lordi (The Lord) - has upset many Finns. The band members wear scary masks, which they refuse to take off, and the lead singer wields a chain-saw. Their song Hard Rock Hallelujah is a radical departure from the folk songs usually associated with Eurovision. Finnish online chatrooms are full of comments from people concerned about their country's reputation abroad. Some Finns have even asked the president to intervene. But Lordi was a people's choice: their hit got more than 42% of the votes cast by televoting in the Finnish final. Lordi, influenced by the American hard rock band Kiss and its lead singer Gene Simmons, has not escaped allegations of links with Satanism. Rumours have been fuelled by the group's refusal to give television interviews, to take off their masks or reveal their real names. But in other media interviews, the rockers have stressed their tongue-in-cheek attitude to entertainment. As if to prove the point, they had a hit in Finland with a song called The Devil Is A Loser. 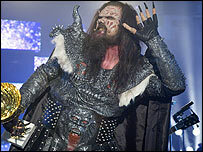 Hailing from Arctic Lapland, Lordi became a phenomenon in Finland with a platinum-selling debut album, Get Heavy, in 2002. Their compilation album The Monster Show has been released in more than 20 countries. The Eurovision Song Contest will take place in Greece on 20 May. "I think it's a stupid joke of Finland," he told the BBC's World Today programme, commenting on the country's Eurovision choice. "Lord have mercy on us Finnish people now," he said, adding that the choice appeared to be a protest by youngsters annoyed that Finland had failed to score highly in Eurovision.